The social nature of today’s Internet is creating new public health and policy challenges. For example, the US in 2014 experienced the largest measles outbreak in nearly a generation, which led to the passing of the nation’s most conservative vaccine legislation, eliminating the personal belief exemption in California. Research has identified online misinformation about vaccines as one of the risk factors for this outbreak. 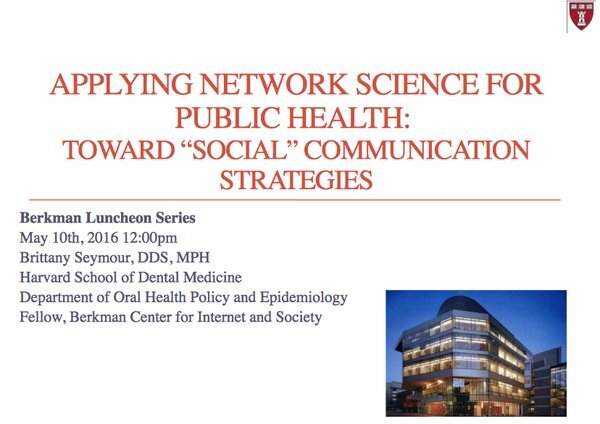 In this talk, Dr. Brittany Seymour — Assistant Professor at Harvard School of Dental Medicine and Berkman Fellow — examines three big data case analyses (water fluoridation, the Ebola epidemic, and childhood vaccinations) to explore ways to employ network science to develop social communication strategies for public health that using the power of the Internet. Theme: Blix by Sebastian Schmieg .